Trump, whoseshifting position on the Iraq War is well-documented, said the decision was akin to “throwing a big fat brick into a hornet’s nest.”CNN first reported Trump’s remarks, delivered at a fundraiser at his Mar-a-Lago resort in Florida. He also scorned the CIA over its flawed information about Iraq dictator Saddam Hussein harboring weapons of mass destruction. “That turned out to be wonderful intelligence. Great intelligence agency there,” Trump joked. As CNN noted, Trump has used this faulty assessment about the WMDs toquestion the reliability of the U.S. intelligence community, particularly regarding itsconclusions about Russia’s meddlingin the 2016 presidential election. 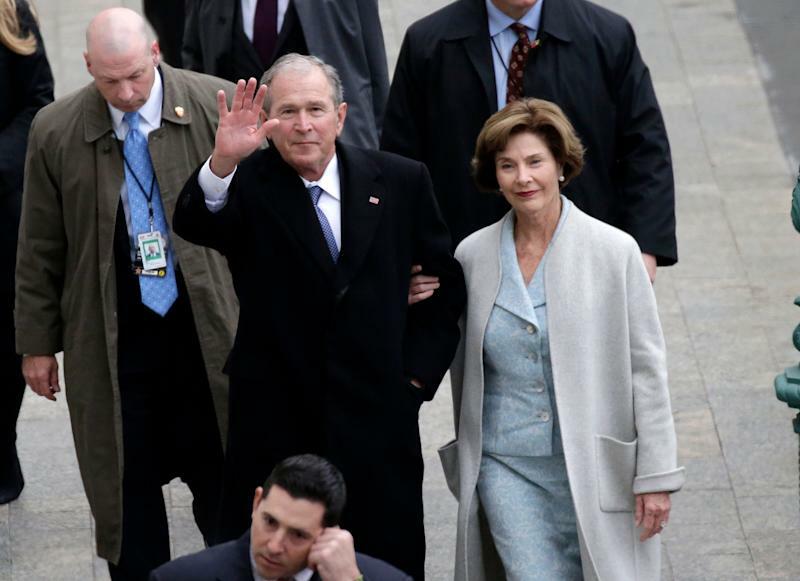 Former President George W. Bush and his wife, Laura Bush, arrive at the Capitol for the inauguration of Donald Trump last year. Though Trump repeatedly insisted during his presidential campaign that he’d long been opposed to the Iraq War, even saying in June 2016 that he wasamong its “earliest” critics, the record suggests otherwise. In a much-reported exchange with with radio host Howard Stern in September 2002, Trump expressed tepid support for the war, saying “Yeah, I guess so” when asked if he supported the impending invasion of Iraq. Trump’s excoriation of Bush wasn’t the only part of his fundraiser speech that made headlines. He also praisedChinese President Xi Jinping’s recent power grabin his remarks.